Goose has long be a traditional Christmas dish, but in the 1950s, it fell out of favour: there were two reasons for this, the first was that during the Second World War, battery farming was ‘invented’ and while chickens and turkeys could be kept indoors, geese wouldn’t tolerate it and the second was that people became fat conscious and were unhappy with the thick layer of fat that sits under the skin of a goose. This is a shame because nearly all the fat actually cooks out and doesn’t affect the fat content of the cooked bird. The way to make the best of this fat is to cook the goose on a raised rack or large trivet over a roasting tin and to pour off the fat after cooking – you can either throw it away, or store it in a jar in the fridge for about three months, during which time you can use it to cook brilliantly tasty and crisp roast potatoes. You need a large and deep roasting tin, preferably with a trivet or rack inside, tinfoil and some seasoning. When you get your goose, defrost it thoroughly in the fridge if it is frozen, then remove the giblets and cut away any fat in the body cavity with kitchen scissors. To make a superb gravy, put the giblets in around two pints of water and bring to the boil, the simmer for around an hour with the lid on the pan. Pre-heat the oven to 200 degrees Celsius/400 degrees Fahrenheit/Gas mark 6. While you are cooking the giblets, take your goose and prick the skin all over with a large needle or skewer, then rub salt and pepper into the skin. To keep the meat moist, cut up an apple and put it in the body cavity. Wrap the legs in foil to stop them burning before the rest of the goose cooks. Put the bird on the trivet or rack, breast side up and cover the whole tin with foil, before placing it in a pre-heated oven. 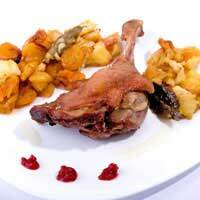 To cook a goose perfectly you should allow 15 minutes per 450 grams and a further 20 minutes. Strain the water in which the giblets have been cooking, and use it to make a rich gravy, while you cook the goose for an hour and then baste the goose with fat that has cooked down into the pan. For the last half hour, take off the tinfoil over the pan to allow the breast to brown and baste again. Then, when the bird has finished cooking, put it on a carving dish to rest and relax for around 20 minutes, this allows the meat to ‘set’ and makes it easier to carve. Because the meat is dense and savoury, goose complemented by citrus notes, such as carrots cooked in orange juice, parsnips with lemon butter, and cranberry or redcurrant sauce. Simple mashed potatoes are better with goose than roast ones, and you can save the goose fat for roast potatoes to serve with a less piquant meat.